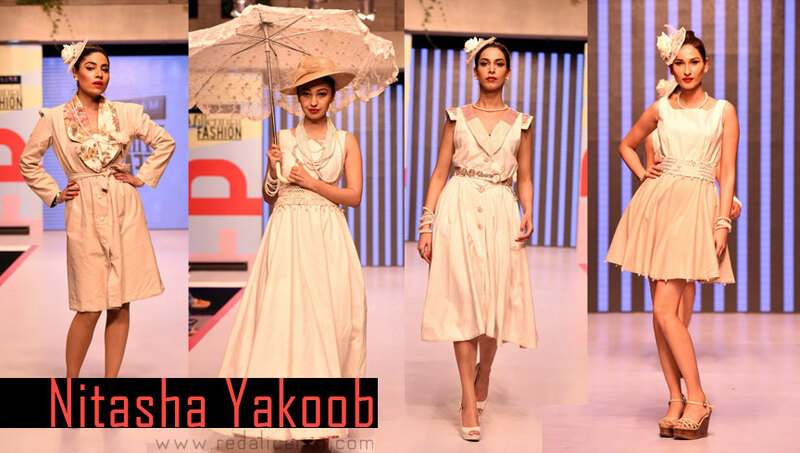 Fashion Pakistan, a leading platform for Pakistani Designers, is know for there bi-yearly Fashion Weeks as well as the opportunity they give to the younger fashion talents. 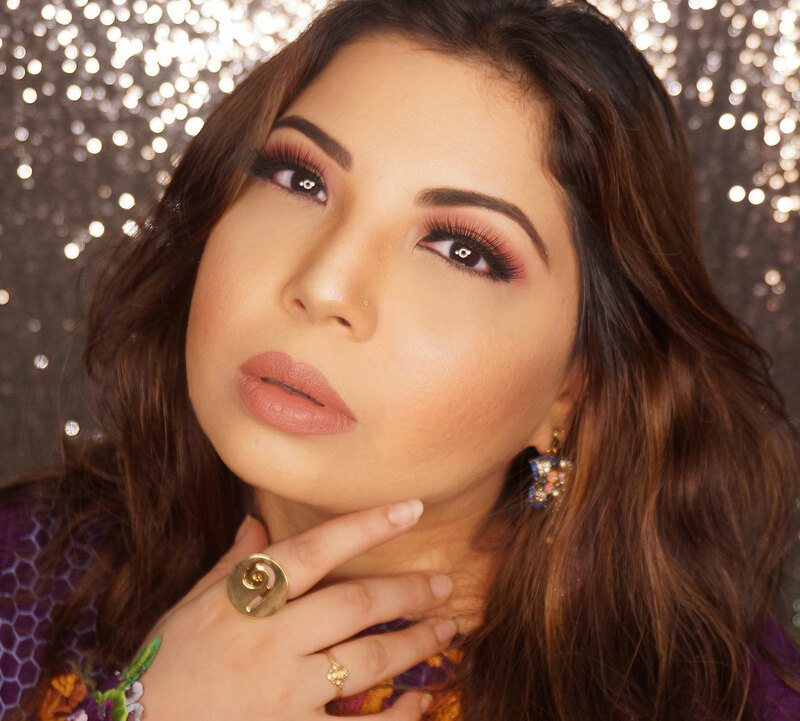 The recent Maybelline New York Millennial Fashion Showcase was a success. I have already discussed how Millennial Fashion showcase is a brilliant platform for emerging fashion brands/individuals in one of my previous POSTS as well. This Post will focus on the work of the designers that debuted. It is not easy coming up with a capsule collection, specially when its your first time. So many things to plan, fabric, design, finishing, connection between different pieces to keep up with the flow, the pressure, the expectations. On the positive side, the HIGH is worth it. MNMF14 introduced a new generation of designers, styling teams, and models. The event also saw leading model Fayeza Ansari debut in her first major showing as a choreographer. 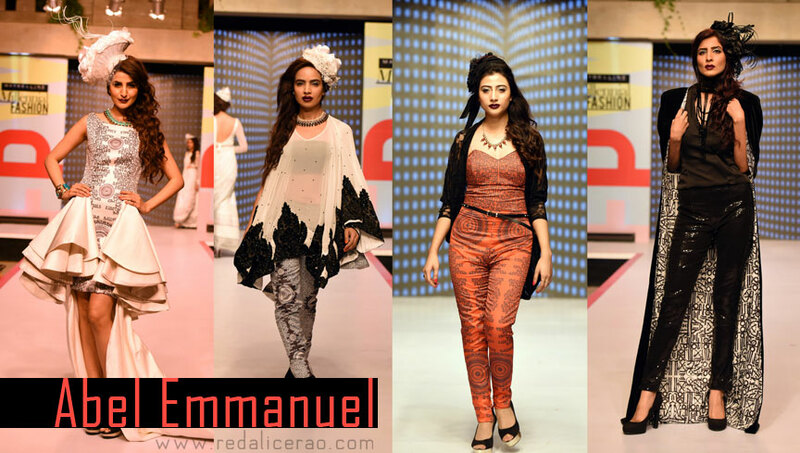 The five young fashion entrepreneurs introduced during MNMF14 were: Aalish, Nitasha Yaqub, Sameer Sain, Abel Emanuel, and Madiha Raza. The Millennial Fashion show started with Aalish Manzoor's collection which was inspired by "Royal Soccer". Honestly, there was not much royalty present but the element of soccer was apparent with the use of honey comb digital prints on silk tops and pants which pretty much saved this collection. There was also one draped, all black gown which did stand out alone as a fluid piece but didn't connect with the rest of the pieces. The entire collection shows promise for a better one next time. Even though collection was hinting "lets play it safe", certain elements and efforts were worthy of appraisal. Nitasha Yakoob's series was inspired by the British Anglo era and I certainly was reminded of afternoon tea in a sweet cafe in France perhaps. Peplum cuts, long and short skirts with simple layering accentuated with subtle gradient in creme shades with pearl/lace detailing gave this collection a cooling edge to the eyes, thus easy to digest and accept. the vintage chic appeal of the collection (I love vintage) gets her some brownie points from me. 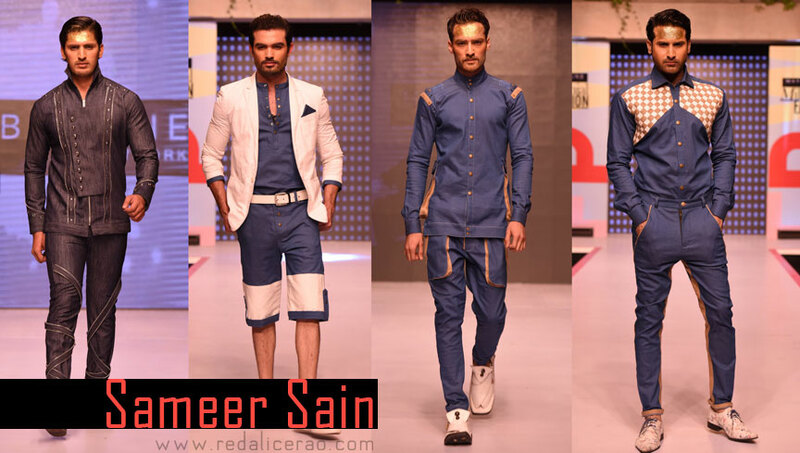 Sameer Sain presented a menswear collection comprising of Denim-meets-Jute, an unusual courtship of two different materials and texture which ended in a successful union. The end result was certainly not disastrous but a bit simpler than expected. Detailing through jute was commendable and the consistency in the shade of denim was not monotonous, rather appealing. The pieces can be worn even better as separates. The Jumpsuit reminded me of my friend/fellow blogger Owais Haji of Owaisism as he has been mentioning how Menswear designer don't dwell much in this look. Well Owais dear, here it is! Some debutantes play it safe, some hit the spot and then there is Abel who was almost perfect but went a bit overboard. Surprisingly this was not even his debut as he has showed earlier on another platform yet the ambitious-ness of "lets do more than is required" was still provoked. Abel's Collection was based on Hebrew calligraphy and henna art, a concept that holds a lot of potential, His prints and embellishments were praise worthy but the layering and structuring was OTT (Over the Top). The bulbous Head gears could have been left alone for a better presentation. His collection was at the brink of winning, but didnt completely get there. In debut collections there is no ugliness, only the "Potentials" and the "Most Promising". Sometimes, just sometimes, we also come across the "Wowzer" who blows us away with their brilliance. Madiha Raza was that WOWZER. The collection, inspired by tropical birds, was beyond a debutante's work. It could easily be compared to a highend couture brand, EASILY. Comprising of digital prints, laser cut details and structured yet fluid sillouettes, the capsule collection was a delight and then some. She was the only designer in the whole lot who got a standing ovation....that certainly says a lot. 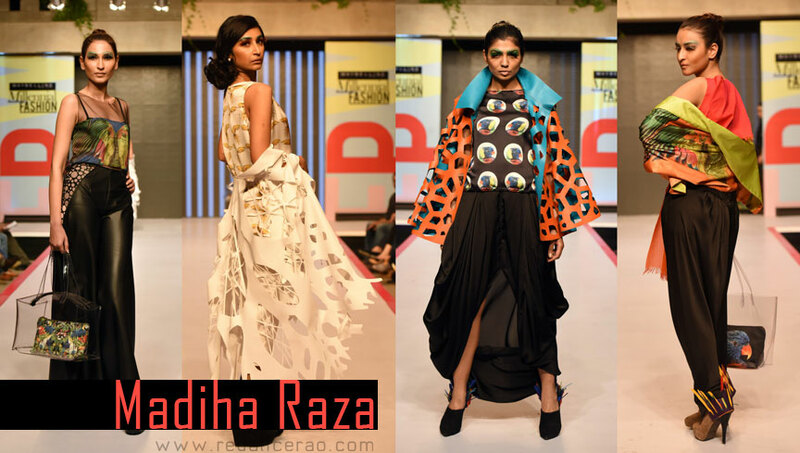 Team of Handmade by Madiha Raza brought together their own expertise and created masterpieces. Accessorizing through feathered detailing on the shoes and complimentary hand bags (also by the designer) were a great touch. The overall event was short and sweet. The backdrop of the Indus Valley School's Nuserwanjee was nostalgic (I studied here) yet a perfect setting. The Fashion Council for the effort, Latitude for their Digital and Social PR /Marketing and Maybelline NewYork for encouragement and support, all should be giving a good pat on the back for putting this together. Which of the designers do you think should win a free slot in the next Fashion week? Abel Emmanuel it is ! I really liked the designs its very amazing !! Followed your blog ! hoping for your follow back !! Amazing blog!! love this great vintage layout and your inspiring posts!! of course im following ! kisses!